Classic Culinary Reference from C.H.I.P.S. This mammoth culinary work represents a clear and accurate translation of the last French edition of Le Guide Culinaire, the complete work which was written and updated by Auguste Escoffier. 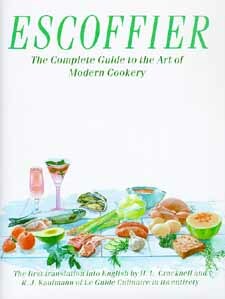 This book is the only completely authentic, unabridged English translation of Escoffier's classic work. This masterpiece contains basic principles which are as valid today as when the book was first published in French in 1903. It has successfully withstood the test of time and remains unequaled among culinary books. Weights, Measures and Temperatures - Abbreviations and Conversions.